This photographic essay tells the story of a back-to-the-land experience which began in February 1989 and lasted through July 1992. 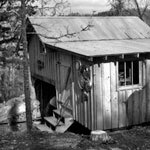 For three years I lived on 55 acres near the Buffalo National River in north central Arkansas where I built two small cabins, raised free-range chickens, practiced organic gardening, captured a spring, and designed a gravity-flow water system. 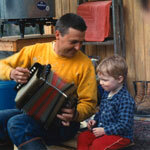 Playing a Hohner button accordion on the front porch of cabin number one. The galvanized wash boiler setting on the wooden table was used for heating water to wash dishes and take showers. The outdoor shower system consisted of a 2.5-gallon jug hanging from a tree branch. The jug was fitted with a ball valve, short hose extension, and shower nozzle. View of pole building. Poles are made of Eastern Red Cedar; fragrant, brownish-red heartwood naturally resistant to rot. 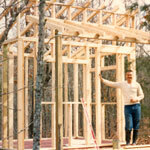 Board and batten siding is locally grown, rough-sawn, yellow pine. Birdhouse gourds (Mexican Bottle Gourds) are growing in the foreground. Theres an old Ford 8N tractor parked in the shed. The drive-through design accommodated easy travel on the old mining road that passes through the shed. The fish skeleton above the tractor shed is fashioned after the logo used by the Swiss Mariners Fife and Drum Corps, Basel, Switzerland. Cutting corrugated metal roofing for the pole building. 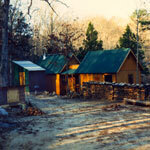 Excavation for this building, as well as the cabins, was done by hand to avoid disturbing the natural surroundings. There is an organic raised bed in the foreground, left side. 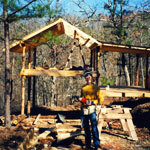 The completed pole building. Hubcaps found along Highway 14 are mounted on the front wall. A galvanized washtub, used for bathing until a shower was built, hangs on the sidewall. A stack of rough-sawn yellow pine, stickered for air-drying, is setting in the foreground. Stickers are 1x2 in. spacers placed every 14 inches or so between each layer of boards. The stickers promote air circulation and helped keep the boards straight while drying. Front view of the pole building taken during mid-summer, 1991. Sweet corn is growing in the organic raised bed. The bench in the foreground is made by resting a heavy slab of Eastern Red Cedar between two large stones. 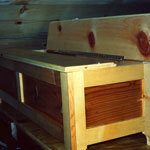 The potting stand on the right was built from yellow pine leftover from building the pole building. 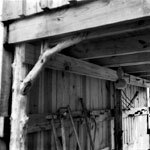 Detail of pole buildings joists and cedar poles. 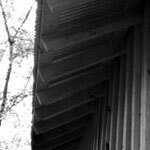 Detail of pole buildings exposed rafter ends. Handmade trestle bench and tea table. The trestle bench is modeled after a handmade Swedish bench I found in a cabin on Big Island, Lake Minnetonka, Minnesota, ca. 1987. 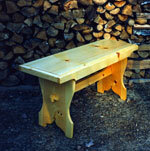 I built the bench using western pine and used yellow poplar to build the tea table. 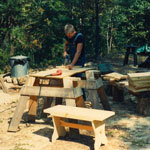 Making Swedish trestle-style benches to sell at local craft shops. 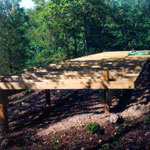 The foundation system used for cabin two is post and girder. The floor joists rest on top of two girders running full length of the house. The girders are bolted to posts set in concrete. 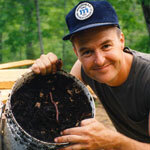 Construction started on cabin two in the summer of 1990, a larger, more substantial cabin than the cabin one. The siding was made from 4x8 sheets of channel-groove cedar plywood siding. this shows the system devised for holding roof members in place while getting ready to install roof rafters. It consists of a vertical brace holding the ridge board in place. 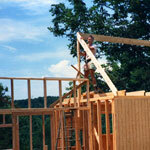 The ridge board is the board that runs along the top edge of all the roof rafters. Cabin two near completion. The 12x16 section on the right provides space for storage and a woodworking shop. The multi-lite window on the end of the building was salvaged from a discarded double-hung sash window. 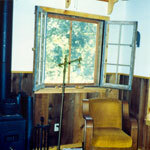 I turned one sash on its side, attached hinges, and fastened it to a custom-built window frame to create a casement window that opened outwards. 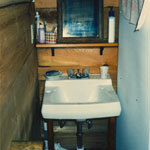 The bathroom in cabin two has a washbasin, small 2x2 shower stall and composting toilet (not shown). The walls are covered with western cedar. 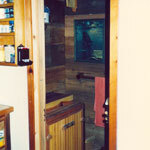 Cabin two, view of entrance to the bathroom from the kitchen. 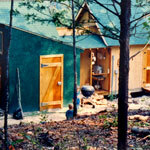 The composting toilet is to the left of the doorway. 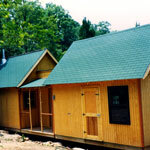 Long view of completed cabin two. The only excavation performed during construction was done in the foreground. A bulldozer came in and leveled an area large enough for a turnaround. Clearing for the building site was all done by hand to minimize disturbing the natural plant life around the house. View of cabin two. Buckwheat is growing in the raised beds. It got tilled back into the soil just after the flowers appeared and before the seeds had a chance to set. Buckwheat grows quickly in warm weather and served as an excellent green manure. 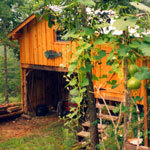 The structure behind the raised beds is a composting bin made from hickory saplings. 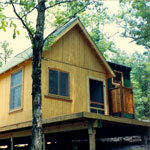 Front view of cabin two. A handmade bird feeder is attached to the top of a red cedar stump near the boardwalk. The stone fire pit and wooden deck served as an outdoor kitchen. 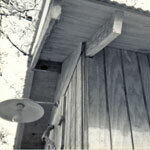 Detail of the exposed rafter ends on the outdoor composting toilet. View of the inside of the main living area in cabin two. All of the windows in this cabin were salvaged from buildings being torn down in Minneapolis, Minnesota. Cabin two was designed to accommodate each window's individual size and shape. View of cabin two looking down from the chicken house. 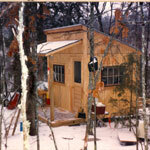 This is the first cabin built shortly after arriving on the property in February 1989. I attended Dunwoody Institute in Minneapolis where I studied architectural drafting. Before leaving for the Ozarks, I drew up the blueprints for this small cabin, which measured 8x10 feet (2.438 x 3.048 meters). 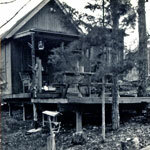 Like cabin two, this cabin also used salvaged doors and windows. 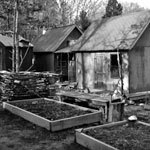 The cabin foundation consists of dry-stacked stones placed under each corner of the house. 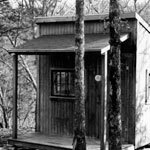 The cabin took about 10 days to build and cost $1,200. 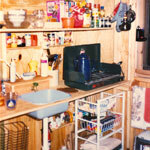 Winter scene (probably around March 1989), cabin one. Construction is started on additional storage space in back. Snow is rare in the Ozarks and usually melts away after a day or two. Cabin one was non-electric. A kerosene lantern (a #80 blizzard lantern from Lehman's hardware catalog) provided light and a kerosene space heater was used to heat the cabin on cold nights during the winter. Non-potable water was captured from a spring branch using an Ozark credit card, which was a local euphemism for a short section of rubber hose used for siphoning. View of the interior showing the kitchen area. Water was supplied by gravity flow to the plastic washbasin. 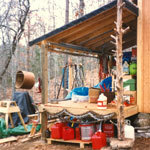 Water was stored in 5-gallon plastic containers mounted outside on the back cabin wall. The PVC pipe extending down from the sink drained grey water into a simple French drain, which was nothing more than a trench filled with gravel directing the water away from the house. Storage area in back with cans of fuel mixtures needed for chain saws, kerosene heater, and lanterns. 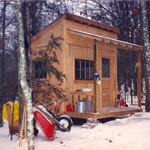 A gas operated, 4000-watt Briggs & Stratton generator was used to run power tools when building the cabins. Framing cabin one is complete. It is difficult to see from the photo, but the cabin is setting about 4 feet from the edge of a bluff--a 40 foot vertical drop. 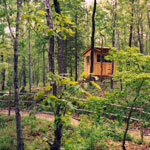 The green foliage you see behind the cabin is the tops of trees growing at the base of the bluff. 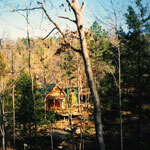 Long view of cabin two in the winter. The overstory trees in this part of the Ozarks consists mainly of Eastern Red Cedar, Yellow Pine, American Sycamore, Gum, and several varieties of Hickory and Oak. The most common understory trees are Dogwood, Redbud, Serviceberry, and farther down in the hollow it is common to see Witch-hazel and Pawpaw. 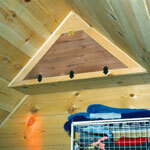 Interior view of cabin two's vaulted ceiling and built-in storage cabinet. Interior view of cabin two showing built-in storage cabinets located where the roofline meets the loft floor. 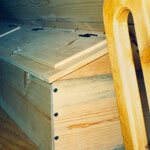 Simple chest made from pine and cedar built to fit between the end of the bed mattress and the edge of the loft floor. 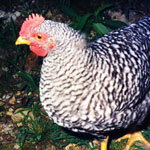 One free-ranging Barred Plymouth Rock chicken. 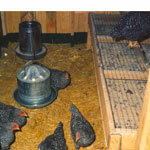 Chicks were purchased at Miller Hardware Co. in Harrison, Arkansas. View of the chicken house in summer 1991. 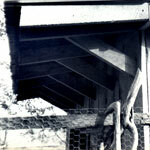 Detail showing exposed rafter ends on chicken house roof. 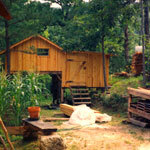 The chicken house was built using rough-sawn, local yellow pine. 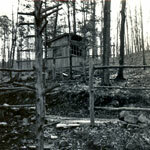 View of the chicken house in January 1992. Interior view of the chicken house. There were two challenges gardening this land: lack of sunlight and lack of topsoil. The land was classified as Clarksville soil. Clarksville consists mostly of chert (also called flint), clay, and carbonate rocks (limestone and dolomite). Along the high ridges the ground was dry with little or no topsoil. The deeper you traveled down into the hollow the topsoil became thicker and rich with humus. 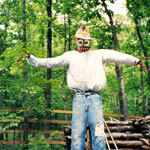 Scarecrow scared away the birds, deer, and sometimes the tourists. The ground was always in the shade deeper down in the hollow. The shade helped retain moisture throughout all the seasons and the higher the moisture content in the leaves lying on the forest floor, the faster they decomposed. Rainy weather was a good time to rake leaves into piles to make compost. Adding cottonseed meal to the mix sped up the decomposition process. 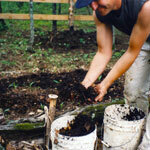 The compost in this photograph is one year old and was the only source of nutrients added to the raised beds.